Today’s Smug farmers’ market find is this Compostables depository. Now technically Smug Scout has known about and used this Compostables depository for several years, so it may not be a new find, but it is still an important one to highlight, especially because Smug Scout was unusually grateful to have it there today. Part of being Smug is not putting food waste in the trash with the very, very few non-recyclable items you purchase. Smug Scout first saw compost many years ago in Germany, where it is called Biomüll (“biological” garbage) and has its own bins on the street to be picked up with trash and recyclables. She always remembers how disgusting and rank those Biomüll bins were. But now she is Smug and has her own problem with Biomüll. It is still rank and disgusting, but now it is in her kitchen. She keeps a plastic bag under her sink, which she brings to the Mar Vista Farmers’ Market and empties every Sunday. That sounds easy and virtuous. Too bad it is also rank and disgusting. This morning when Smug Scout reached under the sink to get the compost bag, she thought she smelled a rotting corpse. (She has actually never smelled a rotting corpse, but she now understands why people on TV throw up violently after exposure to one.) Then, to make matters more vile, she realized the bag, a bag she may have reused one time too many, had a leak, and a loathsome brown trail was crawling across her kitchen floor. She shook her head in horror at the idea that her beautiful Gerbera daisies, Fuerte avocados, September Bright nectarines, and Lompoc asparagus could leave such unspeakable remains, that all those inedible stems and pits could metamorphose into such a stinking, seething mass. The next problem is the disposal of this putrid bag of death. While Smug Scout does not shy away from performing Smug acts in public, the exception is when she is dealing with this gruesome, if ecologically high-minded, business. Now Smug Scout always arrives at the FM shortly before it opens at 9am, and while her main reasons are to get the prime produce and to avoid the murderous parking lot gridlock, her previously unacknowledged reason is to dump her compost without anyone nearby wondering if she is unloading half-decomposed body parts. When she emptied her repugnant load of organic sludge this morning, she also put the leaky plastic bag in the neighboring bin, the one for all other recyclables (yes, including plastic bags, you Smug San Franciscans!). That bag just had its final reuse. 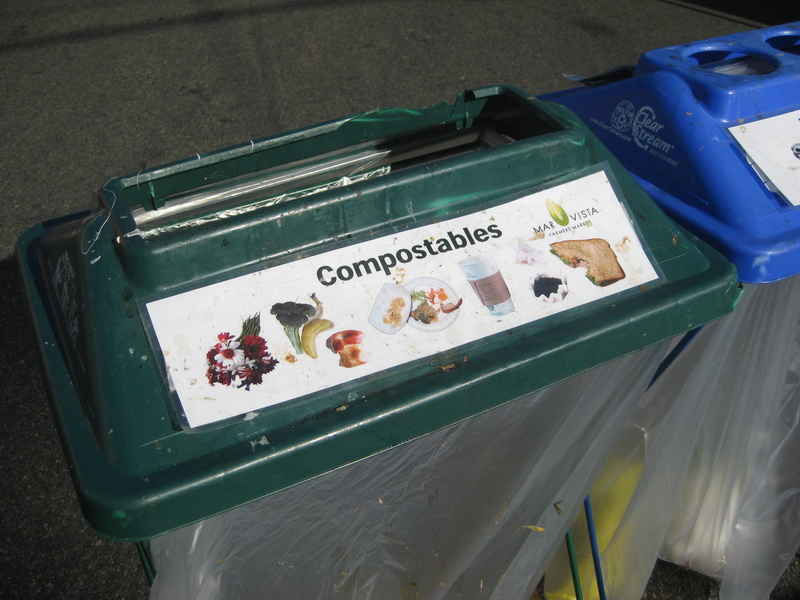 Now you must all wish your farmers’ market had a Compostables depository! Smug Scout is sorry for you if you do not have such an opportunity to compost.